If you run an e-commerce business then you know that marketing is important to drive sales, convert more visitors — and attract them, in the first place. But with so many marketing tactics available, how do you know which to focus on? Especially when some platforms are geared towards pay-to-play — like Facebook. If that question is circling in your head, you’re in luck. In this post, we’ll share 8 marketing strategies your e-commerce business should focus on to see an influx of site traffic, conversions and new sales in no time! By 2040, it’s thought that 95% of purchases will be facilitated by eCommerce. Although that’s a fantastic sign of upcoming success for your eCommerce website, it also means competition will be fierce. Everyone will want a slice of the sales pie, right? Expressed interest in your brand, but not yet converted. Because these people have opted in to your email list chances are they can have a good chance of converting to paying customers. Not a bad return on investment (ROI), especially when considering a newsletter can be drafted, finalized and sent within 90 minutes! But, before we fire off our perfectly-formed branded emails, we’ll need a list of people to send them to. Creating gated content (similar to content upgrades and/or lead magnets). Adding pop-ups to your eCommerce website. For the first two, the idea is this: people have to handover their email address to receive the content. However, there’s one crucial thing to remember when collecting any type of customer information — including email addresses: you’ll need to be GDPR-compliant, if the people are based in the EU. Once you’ve got your list of loyal subscribers, it’s time to let your creativity run free. 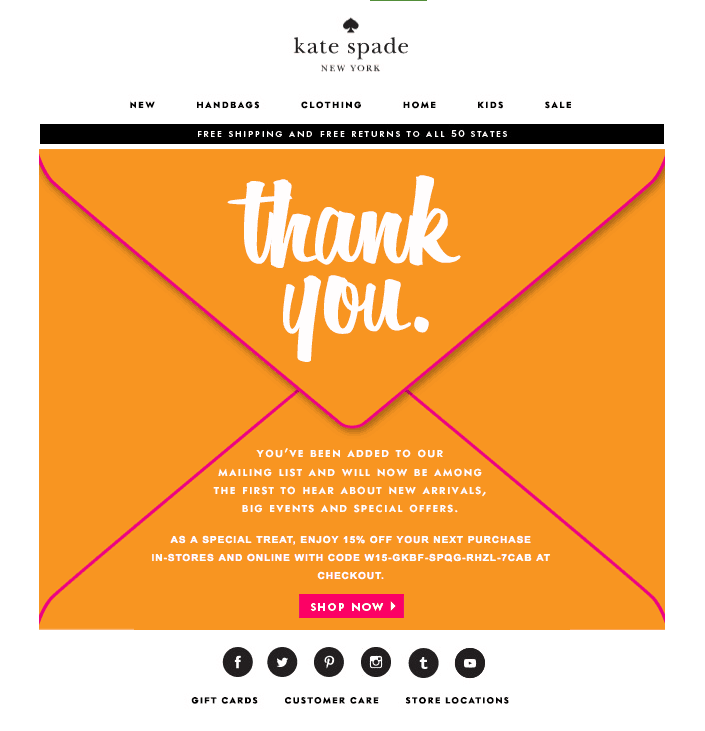 Generally speaking, eCommerce email marketing follows a simple methodology. You’ll need to create a set of welcome emails that send automatically, and walk new subscribers through key information that’ll push them towards a conversion. Behind-the-scenes information about your company. Discount codes — i.e. free shipping or percentage discounts. Since these people are fresh to your brand (and most impressionable! ), it’s a fantastic, high-ROI strategy for eCommerce businesses to push. If you’re looking for a long-term, valuable strategy that’ll drive the majority of your online sales in a few years time, you’ll need to start focusing on organic search. 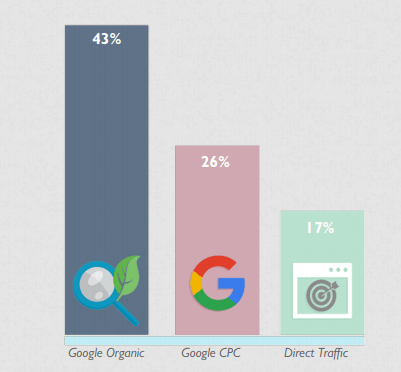 Organic SEO is more effective than quick-fire strategies like PPC. That’s because you earn your place in the Search Engine Results Pages (SERPs), without continually spending cash. …But how can you see this influx of website traffic when you’re just beginning to implement SEO? Create 10x content around these keywords. Build backlinks with optimized anchor text on other, reputable sites in your industry. Backlinks are the strongest off-site indicator considered by Google when determining rankings. But, by including your keyword in the anchor text of your backlink (and making sure it’s from a high Domain Authority site), you could supercharge your rankings and drive more targeted traffic through organic search. When you’re purchasing something online (from an eCommerce store), does product photography play a part in your decision to buy? Whether you’re purchasing children’s play equipment or a new computer, you wouldn’t be alone if you answered “yes”. A whopping 93% of consumers consider images essential in purchasing decisions. You could be missing out by sticking with old, dark and low-quality product photos. Product images reflect your brand and have a major impact on the trust potential customers have in you. 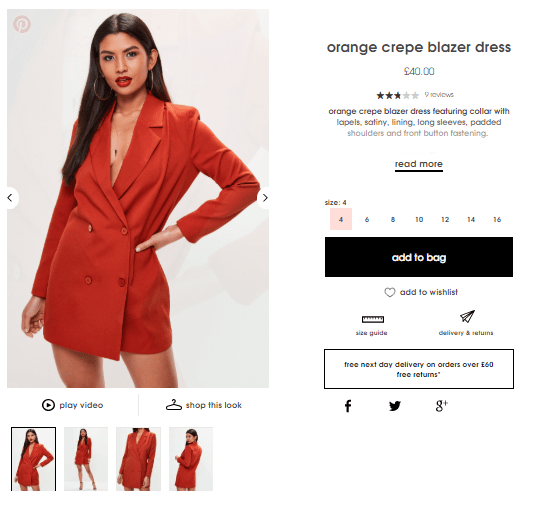 If you’re plastering your eCommerce site with luxurious, high-quality images with a sleek background, you’re instantly more trustworthy than one who doesn’t. Using soft-boxes or natural lighting to make images look bright and airy. Taking 3+ photos of the same product at different angles. Using a white background to allow the product to take center stage. Edit your images to crop unwanted things (like a table in the background!). The best examples for eCommerce product photography are fashion retailers. The background shows the dress clearly, and the variety of angles allow you to see the full product before buying it. Plus, they take product photography a step further and offer a video. That way, potential customers can have a 360-degree view, and know whether it’s the best dress for them. Whether you’re selling large items (like SEO retainers) or small-ticket items (like greetings cards), people want to know they’re buying from a trustworthy brand before they even consider paying for it. 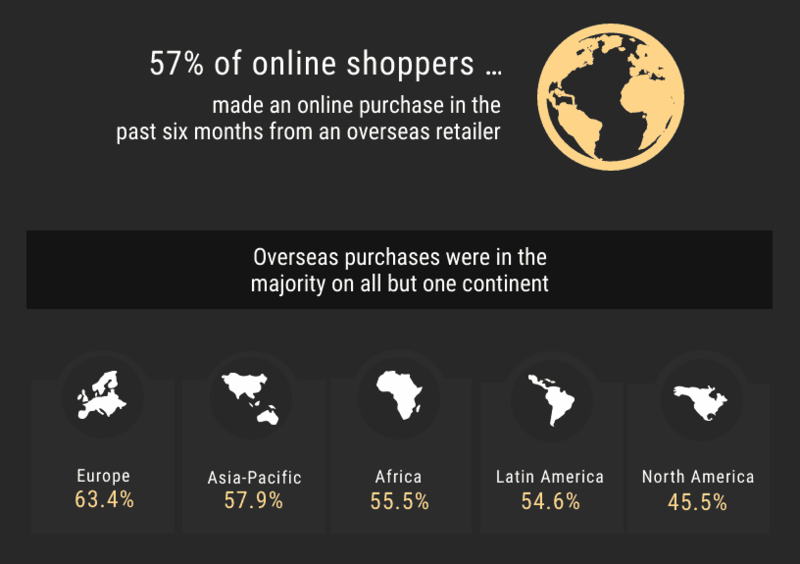 But how can eCommerce businesses do this effectively, and scale it as their brand grows? The answer’s simple: collect as many customer reviews as possible. Collecting raving reviews from previous customers is a fantastic way to prove this and generate a high ROI from this marketing tactic. Add a survey link to purchase confirmation emails (targeting recent customers). Reach out to customers one-on-one, diving deeper and asking tailored questions. Encourage people to leave a review on your Google My Business listing. Offering an incentive for people to take part. 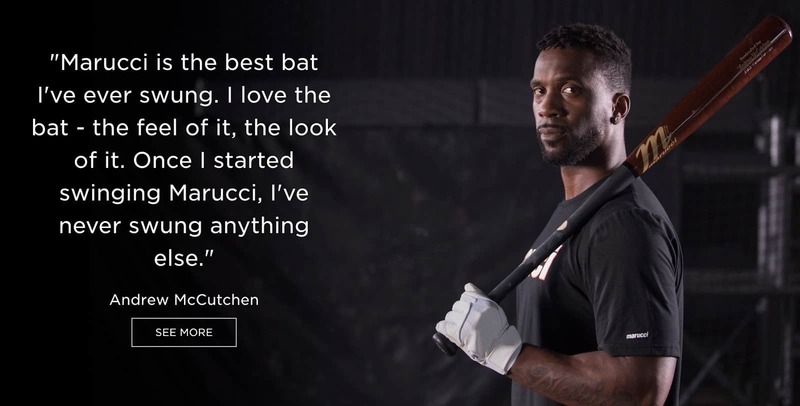 Marucci for example includes a quote with a hero image and a CTA to learn more about the equipment and a series of related videos. If a visitor is interested, they can learn more about Andrew’s perspective before deciding whether Marucci is for them. The next eCommerce marketing tip you should be implementing is website responsiveness. Defined as making sure your website is easy to access, view and scroll on a variety of devices (from mobiles and tablets to PCs), you’ll need to tick this one off your list if you want to see any form of eCommerce success. If your result is “yes”: great! You’re not at risk of alienating potential customers who’re visiting on a smaller device. 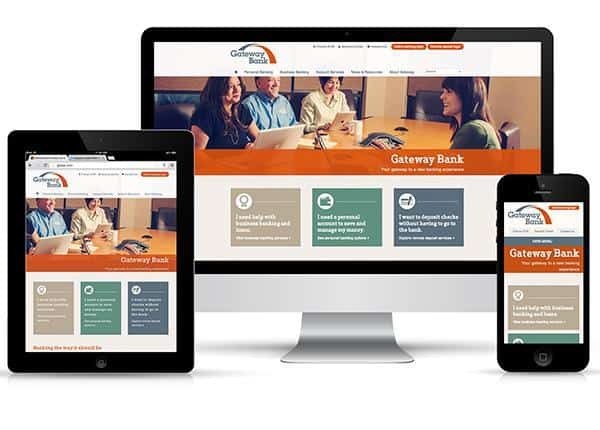 Change your website design, or select a responsive website theme. Talk to your website designer or developer, and ask them to make your eCommerce site mobile-friendly. Since 38% of people will leave a website if the layout or design is unattractive, push website responsiveness to the top of your eCommerce marketing to-do list if you want to drive sales through your online presence. People who add items to their online shopping cart are almost ready to buy. But, then the worst happens: they head to the checkout page, only to hit the X button and abandon their entire basket. Did you know that the average cart abandonment rate for eCommerce websites is over 69%? Taking that average, you could only be converting 31% of your online sales. …Talk about losing potential customers — and their hard-earned cash! But, you don’t have to suffer with these poor cart conversion rates. 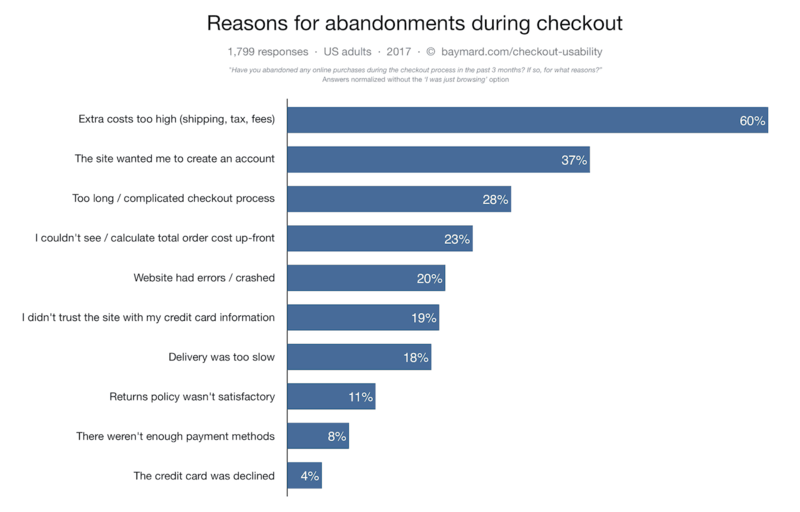 In fact, you can reduce your online cart abandonment rate (and win big with eCommerce marketing!) through retargeting. Target them through Facebook advertising campaigns, displaying the exact products they’ve left. Send targeted emails to people who have an incomplete purchase. Alternatively, you could split-test your checkout page and optimize the page to reduce cart abandonment. This could be done through changes to your content, images or call-to-action buttons (like “buy now” or “finish”). 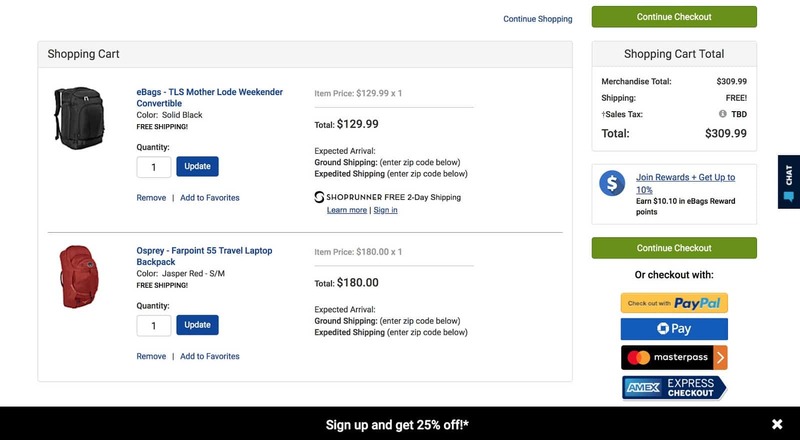 Consider the checkout page on eBags.com. With a clear view of the products in your virtual basket, shipping information and offers to sign up to receive discounts all above the fold they seek to build confidence and engage visitors before they abandon their cart. They know that in being able to retarget people who abandon their carts they stand the best chance of recovering sales. You likely already know that in the marketing world, content is king. That’s no different for eCommerce marketing plans. In fact, it’s probably more true! Businesses who sell their products online rarely have the opportunity to speak with a potential customer face-to-face; they’ve got to rely on the power of their words to make a sale. 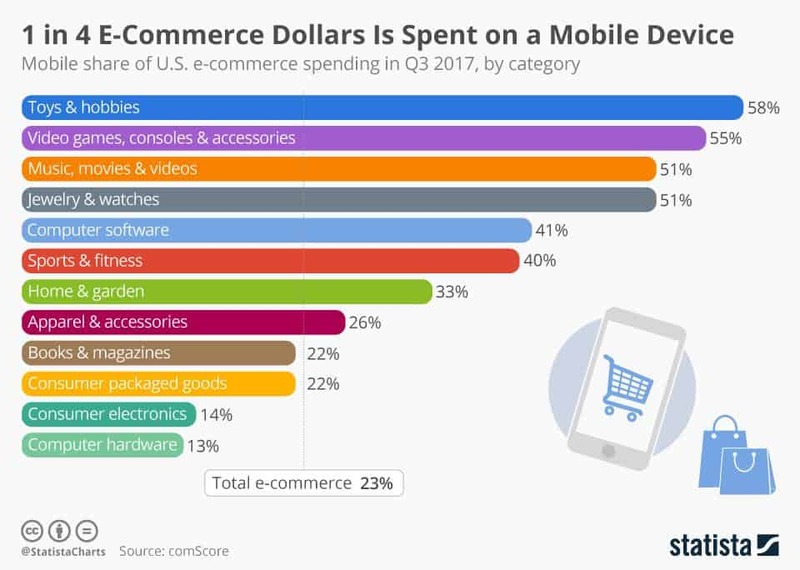 Because of this, your eCommerce brand should be focusing on the creation of educational and or actionable content that attracts (and is loved) by your ideal audience. Over 80% of shoppers conduct online research before making big purchases — and this type of content could push them to convert on your site, rather than a competitor’s. Perform keyword research to see what information your ideal customers are searching for. This will help to make sure your content is relevant, and likely to drive results. Search your keyword in Google, and meet your competition. Analyze each page, asking yourself if you could improve. If you answered “yes”… do it! Create a long-form piece of content that is 10x better than anything else already taking the top spots in Google. Once you’ve created this content (and optimized it for SEO following the tips in tip #3), share it on your social media channels to drive traffic back to the page. Brian Dean from Backlinko created a 10x piece of content titled “SEO Tools: The Complete List”. Notice how I said to test Facebook advertising, rather than general social media advertising? 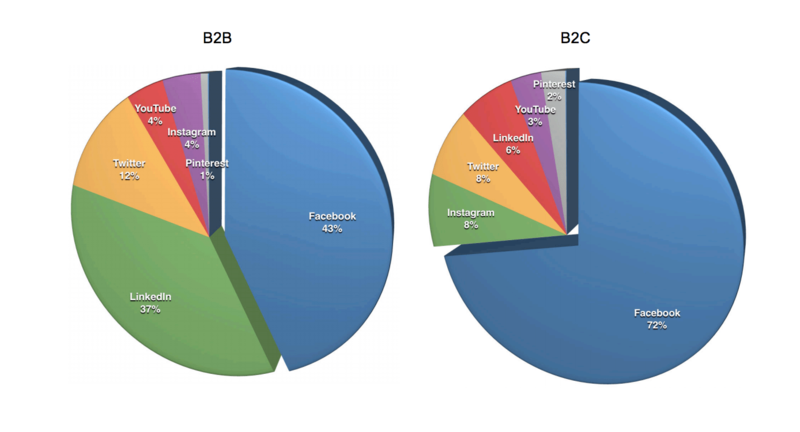 That’s because Facebook tends to have the highest ROI of most social media ad platforms, and consistently remains the top advertising channel for both B2B and B2C marketers. You can start advertising — and making direct sales — on Facebook with a budget of just $5/day. Simply head back to your buyer personas, and match your details in the audience section of your Ad Set. However, you could take Facebook ads a step further and install the Facebook Pixel. This mini-cookie tracks people’s activity on your eCommerce site and connect them to a Facebook profile, allowing you to re-target them, based on their on-site actions. Another option is to target your desired audience around an occasion you know they are interested in. Take Blue Apron for example. 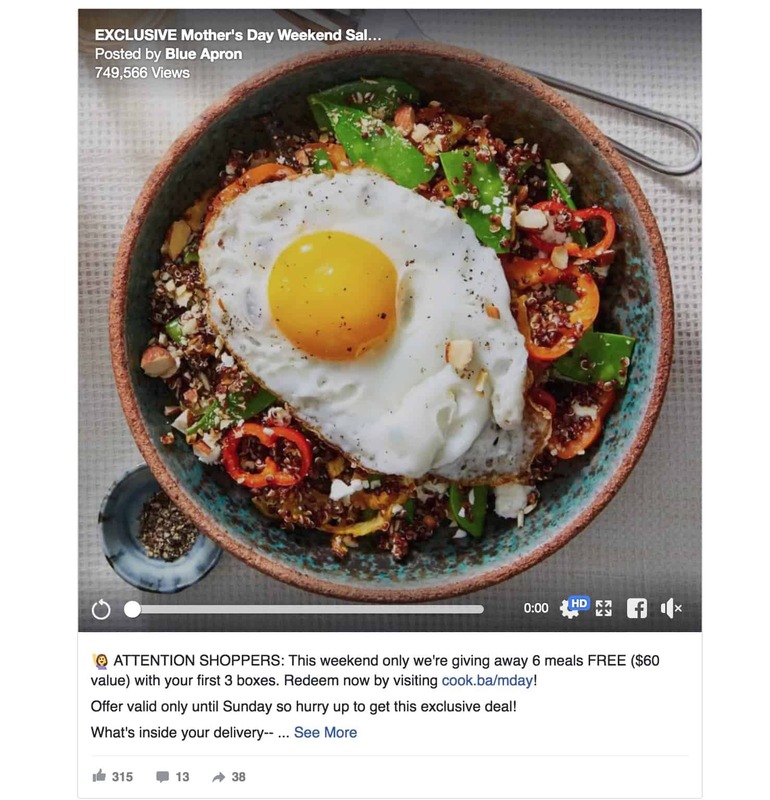 They targeted people shopping for Mother’s Day gifts with this ad to get visitors to try out a week’s worth of delicious meals. They know a lot of people look to take their mothers out for a meal on Mother’s Day but providing a weeks worth of delicious meals to try out for free could be a better alternative. For your ecommerce site to succeed it is important to stay in touch with your customers and the latest marketing techniques. For get their attention and keep it you need to deliver relevant and interesting content and products that suit the needs for your target audience. More importantly monitor your analytics to keep on top of trends, to ensure your website is optimized and you are able to track your results. It is important to remember that some techniques, particularly organic SEO, takes time. To start focus on a couple of the strategies we covered. Once you have them mastered them you can add more to your list of strategies and tactics. Soon you’ll strike a balance between short and long-term results.